Although it’s traditionally made of wood, nowadays, the picket fence can be made of vinyl instead. The white picket fence is an iconic symbol of suburbia. Although it’s traditionally made of wood, nowadays, the picket fence can be made of vinyl instead. So if you’ve been thinking about putting up a new fence, why not give this one a try? Here are some of the reasons to add vinyl picket fences to your yard this spring. After an exhausting week at the office or on the road, no one wants to surrender their entire weekend to taking care of their fences. Luckily, vinyl picket fences are low maintenance. The panels on the fence come with colors soaked in, so you won’t need to spend time painting and then repainting every time the colors fade. If the colors do start to change, then at least that is an easy problem to fix: use your garden hose and some dish soap to wash dirt and grime off of your fence. This is something you can do year-round, and not something that you have to put off until spring and summer. You’ll also notice that vinyl is impervious to damage caused by moisture, rot, mold, and mildew. As a bonus, termites and other insects which would otherwise chow down on your wooden picket fence won’t be able to do that anymore. The vinyl also won’t break and start to splinter or crack. It’s safe to be around no matter how much punishment it takes. Another reason you should consider getting vinyl picket fences is that they are easy to set up and install. Putting up a wooden fence can take forever and a day, even when you have certified contractors come and do the actual work for you. After all, you would like to stick around and keep an eye on things and be available to help them in any way that you can while they are busy working on your new fence. Did you know that a brand new fence can boost your home’s curb appeal? A vinyl picket fence is no exception. The picket fence concept goes back to colonial times when the settlers put up the fences to keep insects off their property. You can evoke that feeling in the present day by using picket fences. 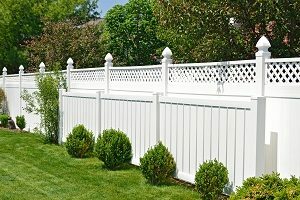 Ever wanted a fence that has dog-ear tops or scalloped panels? Now you can! This entry was posted on Friday, April 5th, 2019 at 3:09 pm. Both comments and pings are currently closed.